Any two human genomes differ at over 3 million positions and each genome contains tens of gene deletions and amplifications. Can we predict the effect of each of these changes, and can we predict how multiple changes combine to affect our phenotype? This is currently impossible, but we are trying to use data in the worm to learn how to approach this. In the worm, over 50 genome-wide RNAi screens have been carried out to date. These cover a wide range of phenotypes from essentiality to neuronal defects to errors in positioning of individual cells. In addition ~100,000 genetic interactions have been analysed. 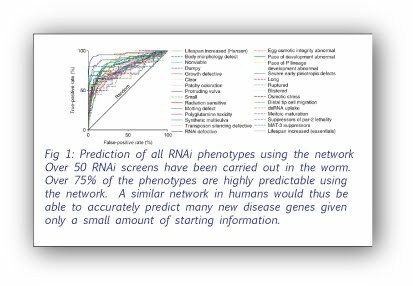 Can we use other datasets to predict these RNAi phenotypes? Can we predict the genetic interactions that we and others mapped? If we can do this in the worm, we should be able to apply similar methods to predicting perturbed phenotypes in humans. In collaboration with Edward Marcotte’s group, we integrated a large number of diverse datasets to make a single network of gene linkages ( wormnet). Genes are linked if they are predicted to share a similar function. The data include expression profiles, physical interactions, and data from multiple other organisms. The network contains almost 400,000 linkages and comprises over 80% of all genes. 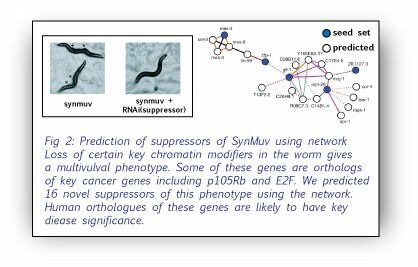 As shown in the figures below, we found that this network gave very accurate predictions for a wide range of RNAi phenotypes and similar approaches should be just as effective in predicting perturbed phenotypes for human genes.